Rucklidgeite: Mineral information, data and localities. Named after John Christopher Rucklidge, Professor of Mineralogy, University of Toronto, who first found and partially described the mineral from the Robb-Montbray mine, Rouyn-Noranda, Quebec (Rucklidge 1969). The Robb-Montbray mine is considered one of the type localities for the mineral (Clark 1993). Rucklidgeite is visually indistinguishable from many other bismuth tellurides. Many specimens sold as Rucklidgeite have analysed as something else. Gold 6 photos of Rucklidgeite associated with Gold on mindat.org. Tellurobismuthite 3 photos of Rucklidgeite associated with Tellurobismuthite on mindat.org. Quartz 1 photo of Rucklidgeite associated with Quartz on mindat.org. Dolomite 1 photo of Rucklidgeite associated with Dolomite on mindat.org. Beaverite-(Cu) 1 photo of Rucklidgeite associated with Beaverite-(Cu) on mindat.org. Bromian Chlorargyrite 1 photo of Rucklidgeite associated with Bromian Chlorargyrite on mindat.org. Stützite 1 photo of Rucklidgeite associated with Stützite on mindat.org. Pyrite 1 photo of Rucklidgeite associated with Pyrite on mindat.org. Chalcopyrite 1 photo of Rucklidgeite associated with Chalcopyrite on mindat.org. Hessite 1 photo of Rucklidgeite associated with Hessite on mindat.org. RUCKLIDGE, J. (1969): Frohbergite, montbrayite and a new Pb-Bi telluride. Canadian Mineralogist 9, 709-715. ZVYALOV, E.N. & BEGIZOV, V.D. (1977): Rucklidgeite, (Bi,Pb)3Te4, a new mineral from from the Zod and Kochkar gold ore deposits. 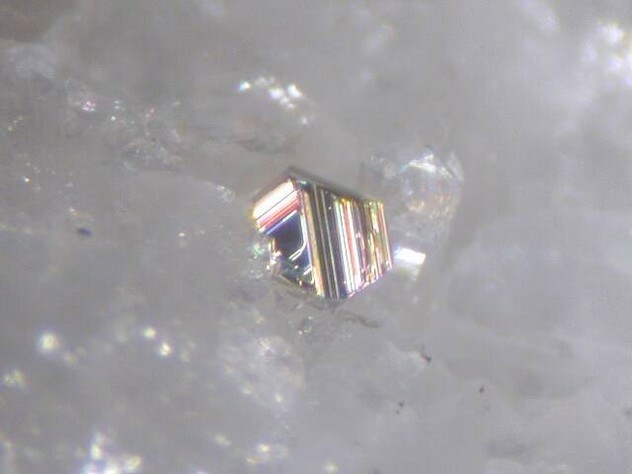 Zapiski Vsesoyuznogo Mineralogicheskogo Obshchestva 106, 62-68 (in Russ.) [English translation: International Geology Review 19, 1451-1456]. Abstracted in: American Mineralogist (1978): 63: 599. CLARK, A.M. (1993): Hey's Mineral Index (3rd ed.). Chapman & Hall, London, U.K. (606). BAYLISS, P. (1991) Crystal chemistry and crystallography of some minerals in the tetradymite group. American Mineralogist 76: 257-265. Canadian Mineralogist (1993): 31: 99. ZVMO,(1977) 106, 62-68; Pekov, I. (1998) Minerals First discovered on the territory of the former Soviet Union 369p. Ocean Pictures, Moscow; Harris, D. C., Sinclair, W. D., & Thorpe, R. I. (1983). Telluride minerals from the Ashley Deposit, Bannockburn Township, Ontario. The Canadian Mineralogist, 21(1), 137-143. RUCKLIDGE, J. (1969): Frohbergite, montbrayite and a new Pb-Bi telluride. Canadian Mineralogist 9, 709-715. ZVYALOV, E.N. & BEGIZOV, V.D. 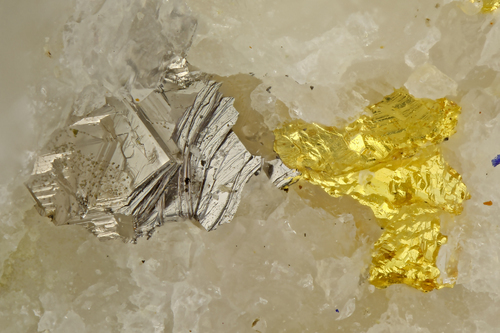 (1977): Rucklidgeite, (Bi,Pb)3Te4, a new mineral from from the Zod and Kochkar gold ore deposits. 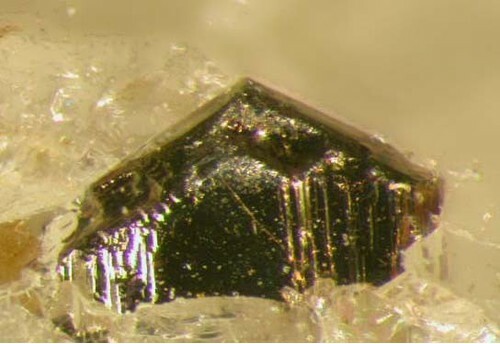 Zapiski Vsesoyuznogo Mineralogicheskogo Obshchestva 106, 62-68 (in Russ.) [English translation: International Geology Review 19, 1451-1456]. CLARK, A.M. (1993): Hey's Mineral Index (3rd ed.). Chapman & Hall, London, U.K. (606). ⓘ Tonggou Au deposit (incl. Chucha-Luanshi Au deposit) ? ⓘ Maoping Au deposit ? Kase et al (1993) Canadian Mineralogist, 31, 99-104. Ii et al (1993) Koubutsu-Gakkai Kou'en-Youshi, 145. Cook, N. J.,Ciobanu, C.L.& Danushevskiy, L, (2007): LA-ICP-MS determination of gold in Bi-chalcogenides from four deposits in the Fennoscandian Shield. Geological Survey of Finland, Guide 53, 23-30; Bonev, I. K., Petrunov, R., Cook, N. J., & Ciobanu, C. L. (2005). Kostovite and its argentian varieties: Deposits and mineral associations. Geochem. Mineral. Petrol.(Bulg. Acad. Sci. ), 42, 1-22. Anthony, J.W., et al (1995), Mineralogy of Arizona, 3rd.ed. : 358; Graeme, R. (1993), Bisbee revisited, Min.Rec. : 24: 421-436.; Bonev, I. K., Petrunov, R., Cook, N. J., & Ciobanu, C. L. (2005). Kostovite and its argentian varieties: Deposits and mineral associations. Geochem. Mineral. Petrol.(Bulg. Acad. Sci. ), 42, 1-22.
ⓘ Golconda; Hesperus; Senate? ? Dietrich,R.V.,1990,Minerals of Virginia1990:Virginia Department of Mines,Minerals and Energy,Richmond,Virginia,477 pgs.